In case you hadn't heard, Puss in Boots is The Most Interesting Cat in the World. Despite being merely a supporting player in the Shrek franchise, now the sword-wielding cat is in his own feature, as we've seen in the teaser trailer and full-length theatrical trailer. We recently featured a cool motion poster for the film, but now we have a poster that sits still (just like all cats are supposed to) which has our hero cat Puss in Boots, his female accomplice Kitty Softpaws (Selma Hayek), Humpty Dumpty (Zach Galifianakis) and frumpy Jack and Jill (Billy Bob Thornton and Amy Sedaris) looking pretty heroic. See the poster below! A story about the dramatic events leading up to the sword fighting cat's meeting with Shrek and company. 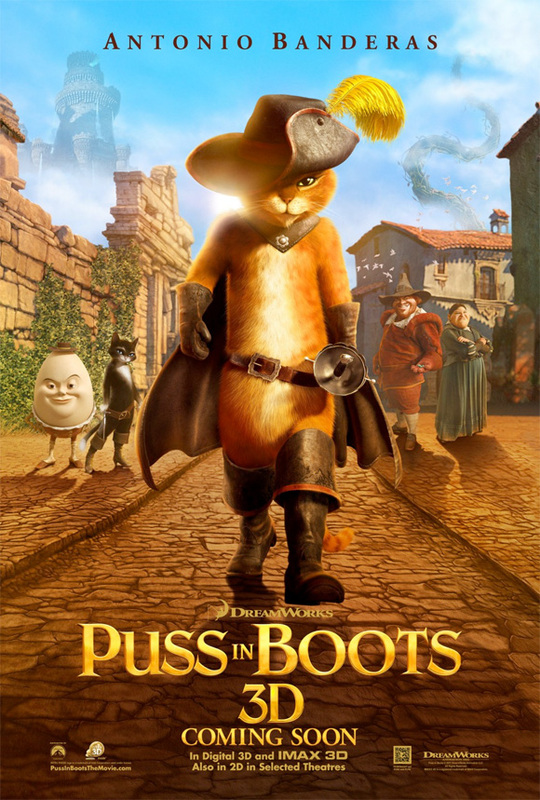 Puss in Boots is directed by animator Chris Miller, who started as a story artist and directed Shrek the Third (not fourth) a few years back. The screenplay was co-written by Brian Lynch (Hop), David H. Steinberg (The Babysitter), Tom Wheeler ("The Cape") and Jon Zack (Shrek the Third). This is a new spin-off of the Puss in Boots character from the Shrek franchise created at DreamWorks Animation. Paramount is bringing Puss in Boots to theaters in 3D everywhere starting on November 4th this fall. Anyone excited for this already? I quite like the character but more so in a minor or comeo not a whole film. The poster stinks. Bad poster, good looking movie. I'm much more interested in this than I was in either of the last 2 Shrek films. Doesn't feel so stale.